This tutorial shows you how to use a silkscreen to create decorated sheet of polymer clay that is reminiscent of opulent tapestries, using both the rich colors and the metallic, sparking accents. You will then learn how to make a pair of earrings featuring your Opulent Tapestry sheet. I don't just show you the idea, I take you through each of the 42 steps. It's all clearly spelled out, from creating the colors, using the silkscreen, to forming the wire. Be assured that you won't be left wondering due to a missed step! This tutorial is perfect for beginners and those wanting to learn more about constructing jewelry (and not just beads) with polymer clay. It’s a beautiful and fun project that can make earrings, pendants, or even opulent and rich ornaments that sparkle in your holiday tree. This project tutorial is 28 pages long and contains 55 photographs. This is a easy level tutorial that requires little to no previous polymer clay experience. 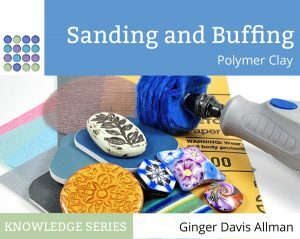 I don’t, however, cover the basics of working with polymer clay, so if you’re new to this material you might want to add the Polymer Clay Essentials eBook to your order. Eager to learn more about silkscreens? Don’t miss my All About Silkscreens on Polymer Clay eBook. In addition to the usual polymer clay and crafting supplies, you’ll need to have a silkscreen stencil of your chosen design and some alcohol inks. The resources section contains links to many silkscreen vendors and artists around the world. I also give a useful list of polymer clay suppliers around the world. Text and images in this tutorial are Copyright © 2015-2017 by Ginger Davis Allman, of The Blue Bottle Tree, all rights reserved. That means you can’t share this tutorial, teach or give it to friends, post the file or contents online, or sell it, etc. However, your creations are always yours to sell, share, and enjoy as you desire. I always appreciate credit and a shout-out whenever possible. Thank you! This is lovely! And, as always, it is thorough, well-written and beautifully illustrated. Ginger’s tutorials are always well worth the money. I really love how Ginger provides this perfect project to go along with the Silk Screening tutorial. This shows clear and creative applications of silk screening to make gorgeous earrings, but is adaptable for pendants as well. Ginger gives step by step instructions that are easy to follow, and I can hardly wait to make some beautiful projects using her methods. As always, Ginger provides extra tips and information from her trial and error process of writing her tutorials. She helps me know exactly what to do, how to do it, and what to avoid. I have loved using all of Ginger’s tutorials-I have a huge collection of her fun, creative, and thorough tutorials and information about using polymer clay. Thanks for all your hard work, Ginger. You have made my life easier and enriched! Ginger has done it again! Along with the silkscreen tutorial, this is a wonderful tutorial on how to make earrings and other wonderful pieces. Her instructions are clear and i love the pictures she provides. It is a helpful guide to more beautiful art. Ginger’s tutorials are all wonderfully comprehnsive and she aswers questions when help is needed. She even remembers that i have a cat named Mouse. Now that shows you what a wonderful person she is! Good tutorials help you always produce good results. And this is a good tutorial. Well-written and well-illustrated, this tutorial is a good companion piece to her other tutorial on using silkscreens. And the project(s) in this tutorial are beautiful. I love this tutorial! It’s a great project style layout and teaches you how to create a lovely background, add a metallic silkscreen pattern and finish off the whole thing neatly with beaded hangers. I’ve used the technique for jewelry, boxes, Christmas ornaments and even lanterns and it always turns out great! This tutorial is a very clear and concise project which gives you everything you need to make finished pieces. So much detail, and great pictures, too. Thank you, Ginger! I love Ginger’s tutorials! I gobbled down All About Silkscreens and Opulent Tapestry, and am more slowly making my way through Sanding and Buffing. Ginger is a wonderful teacher, and the books are beautifully photographed and clearly organized. They have the same elegant simplicity in look and design as her website. Really nice, and perfectly user-friendly. Thank you Ginger for another excellent tutorial. I can’t wait to get started. All the tutorials you provide are detailed and so very easy to follow. Everything I’ve tried has worked like a charm. I would recommend any of your tutorials to anyone new or experienced in polymer clay. After all, we all continue to learn and grow with this medium. Great tutorial from Ginger! Very thorough. I’ve really enjoyed this tutorial and have become a bit obsessed with silk screening since. I think you can really give a professional look to your work so easily using this method. I’ve really emjoyed this technique and I’m still making different items using this process. Thanks Ginger, you are a treasure to beginners like me and this has given me so much pleasure.